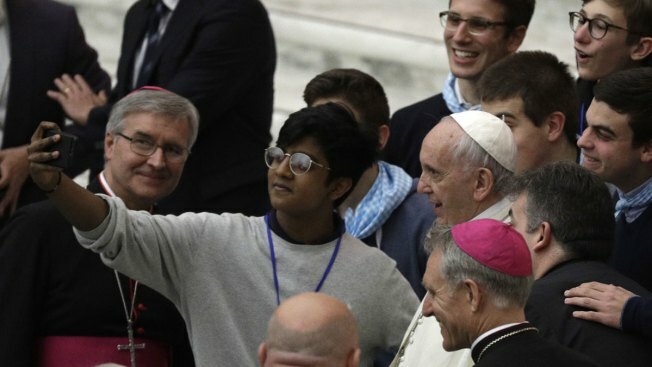 After Francis made headlines recently by seemingly denying the existence of hell, the new document strongly affirms the real and present danger of the devil who "poisons us with the venom of hatred, desolation, envy and vice"
A boy takes a selfie with Pope Francis in the Paul VI Hall at the Vatican, at the end of an audience with the youths from the diocese of Brescia, northern Italy, Saturday, April 7, 2018. In a new document released Monday, called "Rejoice and Be Glad," Francis said defending the poor and migrants is "equally sacred" to defending the unborn. Pope Francis is calling for ordinary Catholics to live holy lives in whatever they do, stressing that the "saints next door" are more pleasing to God than religious elites who insist on perfect adherence to rules and doctrine. In a new document released Monday, Francis said defending the poor and migrants is "equally sacred" to defending the unborn — a not-so-veiled critique of the conservative right in the U.S. for whom opposition to abortion trumps the Gospel mandate to love and welcome the stranger. 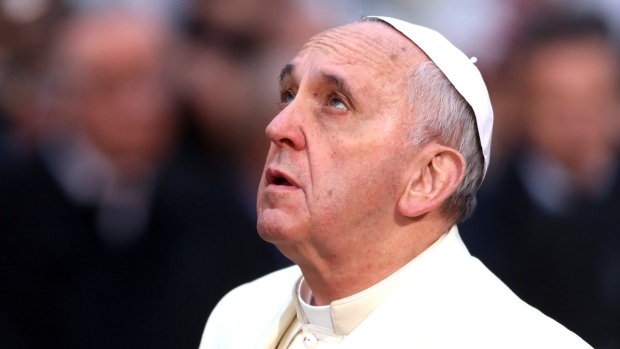 The document, "Rejoice and Be Glad," is the third apostolic exhortation of Francis' papacy, after the first two riled conservatives by condemning capitalism and suggesting divorced and civilly remarried Catholics can receive Communion. It was signed by Francis on March 19, the fifth anniversary of his pontificate, and perhaps fittingly reaffirmed the centrality to his papacy of the "Beatitudes," the eight biblical blessings extolling the meek, the poor and the merciful. After Francis made headlines recently by seemingly denying the existence of hell, the new document strongly affirms the real and present danger of the devil who "poisons us with the venom of hatred, desolation, envy and vice." 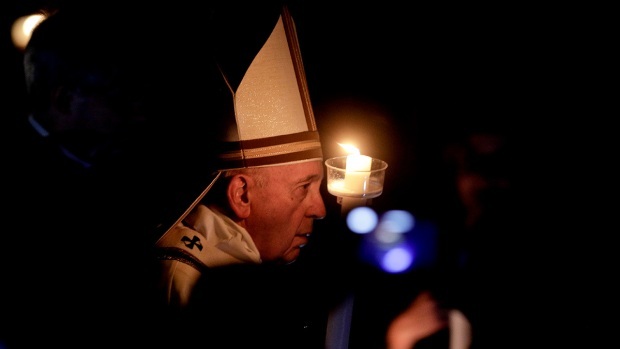 In the text, Francis said he had no intention of defining holiness or setting out the various ways to be made a saint. Rather, he said he wanted to re-propose the church's universal call to holiness that can be found next door, "the middle class of holiness" of a husband who loves his wife, a mother who patiently teaches her child, an employee who works with integrity. Stressing that perfection isn't required, he listed as "enemies of holiness" those who claim a superior knowledge of laws and doctrine and force others to submit to their "myopic," absolutist interpretations. He said they reduce Jesus' teachings to a "cold and harsh logic" and a "self-centered and elitist complacency, bereft of true love." He didn't name names, but the admonition appeared aimed at conservatives in his own church — including some Vatican-based cardinals — who have balked at his mercy-over-morals style and loose interpretations of church teaching, particularly on marriage and liturgy. Francis said their "sinister ideology" finds expression in "an obsession with the law, an absorption with social and political advantages, a punctilious concern for the church's liturgy, doctrine and prestige." Much of the conservative criticism of Francis has focused on his last apostolic exhortation, the 2016 "The Joy of Love," in which Francis opened the door to letting divorced and civilly remarried Catholics receive Communion. Conservatives say the document has split the church, caused confusion and undermined church teaching on the indissolubility of marriage. Just last week, two conservative cardinals headlined a symposium in Rome that issued a declaration rejecting Francis' opening to divorcees and begging the pope to "confirm us in the faith." Francis hasn't responded directly to four conservative cardinals who have demanded that he clarify his 2016 opening, but in the new document he noted that within the church "there legitimately coexist different ways of interpreting many aspects of doctrine and Christian life" — even if it leads to confusion. Francis also criticized those who prioritize certain ideologies over basic Gospel teaching, listing, for example, those who focus on abortion over all other issues. Defending the unborn, "needs to be clear, firm and passionate," he said. "Equally sacred, however, are the lives of the poor, those already born, the destitute, the abandoned and the underprivileged, the vulnerable infirm and elderly exposed to covert euthanasia, the victims of human trafficking, new forms of slavery and every form of rejection." "That a politician looking for votes might say such a thing is understandable, but not a Christian, for whom the only proper attitude is to stand in the shoes of those brothers and sisters of ours who risk their lives to offer a future to their children," he wrote.